If you wish to seek inner peace, away from your city life in Bangalore, visiting Kanchipuram during the weekend can be the best option. One of the Seven Sacred Cities of India, Kancheepuram or Kanchipuram is a very well-known pilgrimage spot. Often referred to as the ‘Golden City of Thousand Temples’, it is placed on the western banks of the River Palar. A visit to Kancheepuram can be quite relaxing for the mind, body and soul. This city is a major seat of Tamil learning as well as commercial center. It is known for producing the finest of silk all around the globe. While visiting Kancheepuram, buying a silk saree is a must. A visit to Kancipuram can be a cultural treat for the visitors. You can opt for a direct train from Bangalore to Kanchipuram. The Kanchipuram railway station is around 2 km away from the city centre. : The best option is to hire a taxi to go to Kanchipuram from Bangalore, following NH 4. However, you can also get on-board state-run or private buses. Dedicated to Goddess Parvathi, Kamakshi Amman Temple is the most popular temple in Kanchipuram. Probably, the temple was originally built before the 7th century by the Pallava rulers. Later in the 14th century, it was re-built by the Cholas. Placed in the center of the city, this temple is one of the three holy places of Sakthi worship. The temple complex also consists of Sankaracharya shrine, one the greatest Hindu saints. Built by the rulers of the Vijaynagar Empire, Devarajaswami Temple is dedicated to Lord Vishnu. This temple with beautifully carved pillars, boasts of a huge marriage hall that was erected in the memory of the union of Goddess Laxmi and Lord Vishnu. The complex also consists of a water tank, containing the statue of the lord inside it. 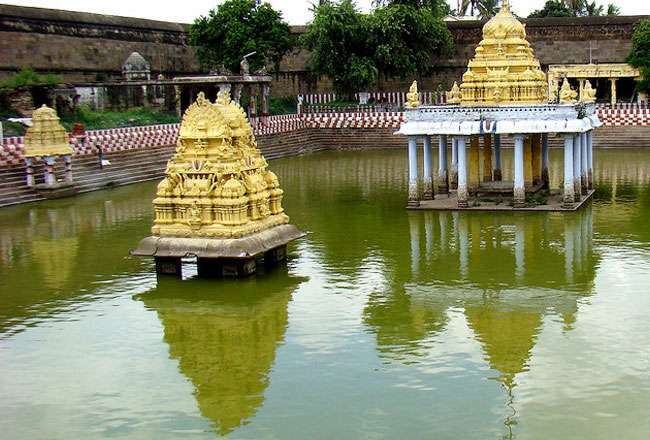 Kanchipuram’s largest temple Ekambaranatha temple is spread in an area of 20 acres of land. Dedicated to Lord Shiva, it is built by the Pallava rulers, which was later re-vamped by the Cholas and Rayas. The temple complex has 3500-yr old mango tree and 100 lingas made from one solitary stone and a thousand-pillared hall. The unique Kachapeshwarar Temple consists of interesting figures where Lord Vishnu in the form of a Kachap that is a tortoise, is worshipping Lord Shiva. The temple boasts of impressive exterior as well as interior, where both have detailed engravings and embossed sculptures. One of the oldest and most noteworthy temples in Kancipuram is the Kailasanathar Temple that was erected by Rajasimha, a Pallava ruler, during the 7th century. A Dravidian architectural masterpiece, this temple consists of 16-sided Shiva Lingam made from black granite. The exterior and interior of the Kailasanathar temple consist of beautiful carvings and sculptures. Dedicated to Lord Vishnu, the rulers of Vijayanagar kingdom built the striking Varadaraja Temple during the 10th century. The temple complex bounded by an outer wall consists of Kalyanamandapam, a 1000-pillared hall. Let Our Travel Experts Craft Your Dream Itinerary!